It is the biography of Great Mystic Shaikha Ibne-Arabi containing his early life, the representative works and sayings with his noteworthy views on prince topics of God, Prophethood and revelation. As per general openion he was a controversial personality contemporaries, as the adherent sufis and orientalist hailed him considering a mystic of rare eminence while opponent scholars denounced him calling a heretic, a Zindiq. Thus to draw out the pearl of reality a thorough study of this book, in sight, is probably unavoidable. One Friday in 1928 one of my Arabic masters enquired of me: "Shaikh al Akbar writes that if he had not written the Futuhat al-Akbar he would have been set on fire. How could he has been so set on fire? This question made me highly inquisitive about the Shaikh, and I took the earliest opportunity to study him. The following statement by E.G. Browne in his Literary History of Persia (p 500), added strength to my resolve: "so far as I am aware, no adequate study of his works and doctrines have yet been made in Europe though few fields of greater promise offer themselves to the aspiring Arabist who is interested in this characteristic aspect of Eastern thought,"
After making a fair study of his representative works the problem was what to do and on what topic to concentrate. A complete analysis of his works would take a long time; and as far as I know there is not even a biography of the Great Shaikh in English which can be called satisfactory. So in this small volume I have confined myself to a detailed biography of the Shaikh, a short account of his works, translation of some of his valuable sayings and of his views in brief on a few topics. 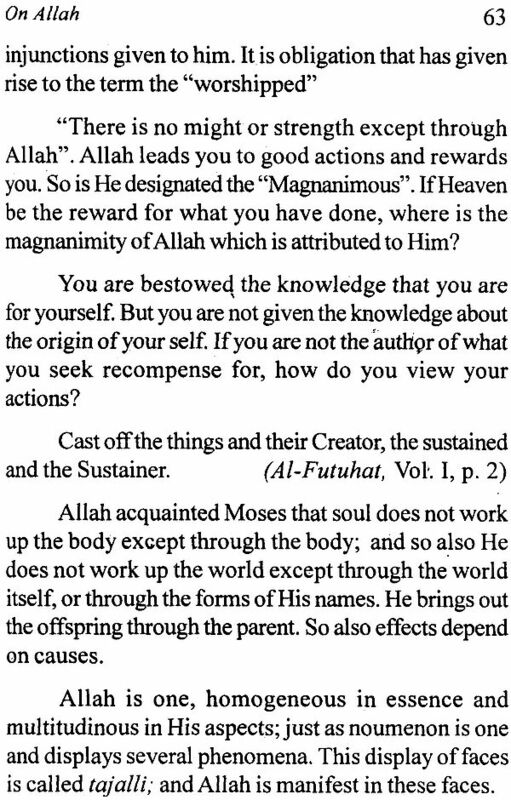 The biographical portion of this work has been directly translated from Nafh-ut-Tib of al-Maqqari (Which contains the best extant biography of the Shaikh) Shadhrat al-Dhahad of Abu al-Falah Abd al-Hayy (the Arabic text of which is published in the Journal of the Royal Asiatic society in 1906). And the biographical note attached to the Futuhat al-Makkiyya. I have also consulted the book called wisdom of the Prophets by Khaja Khan which contains a short note on the life of the Shaikh, and used the article in the encyclopaedia of Islam for fixing get certain dates. Besides, I have derived what help I could get from Browne's Literary History of Persia and Clement Huart's History of Arabic, Literature. 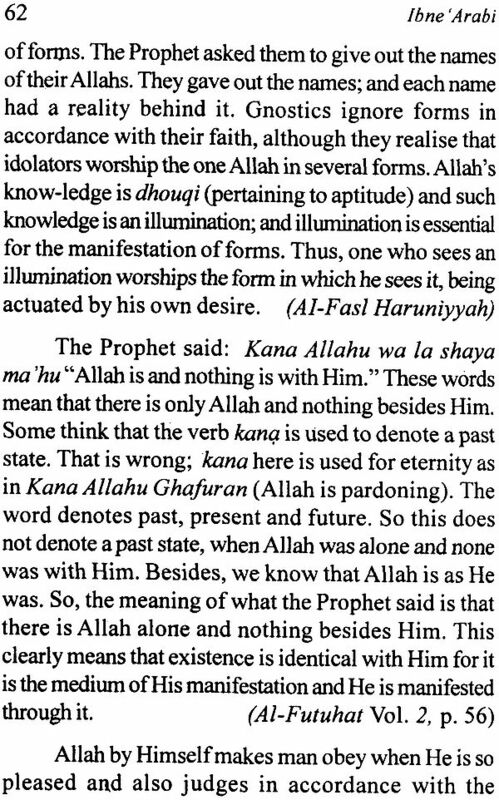 The sayings of the Shaikh have been translated from the Shadharat al Dhahab with some help from Nicholson's work. The short notes on the views of the Shaikh on certain topics were gathered by me from both the Futuhat al-Makkiyya and the Fusus. 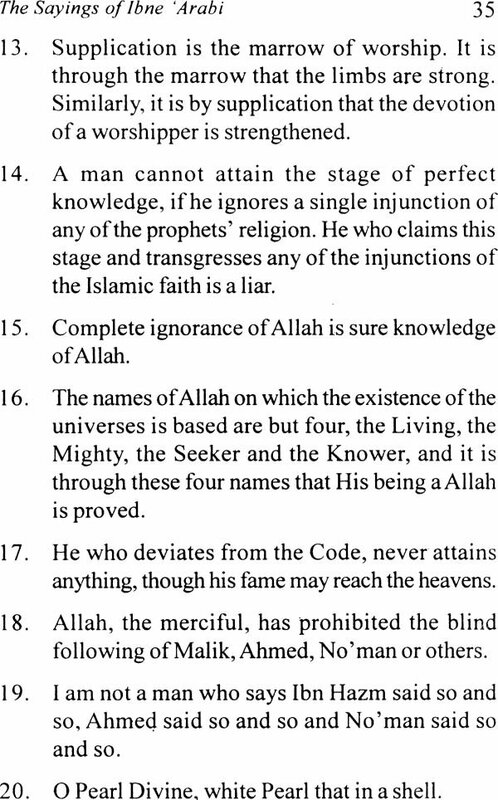 I have derived much help from Nicholson's Notes on the Fusus in determining the Shaikh views on God. His views on a few topics have been laboriously collected by me from the original works of the Shaikh. My indebtedness to the European authors is only to the extent of their valuable remarks and suggestions. Besides it must be admitted that, but for Nicholson's endeavours, the Arabic text of Shadhrat al-Dhahab would not have been available to me. Moreover, Nicholson's Notes on Fusus al-Hikam, and Khaja Khan's wisdom of the Prophets have helped me for a good deal in making a scientific study of the Fusus. As far as the biographical portion of this book is concerned nothing can be added to it unless some new manuscripts containing the life of the Great sheikh are discovered. As for the other portions, they are fruits gathered by hand cast at random. Some of the best fruits may have escaped. Yet to the best of my knowledge this will be the first concise book on Ibne – Arabi giving all the particulars that may be required by a casual reader interested in him. 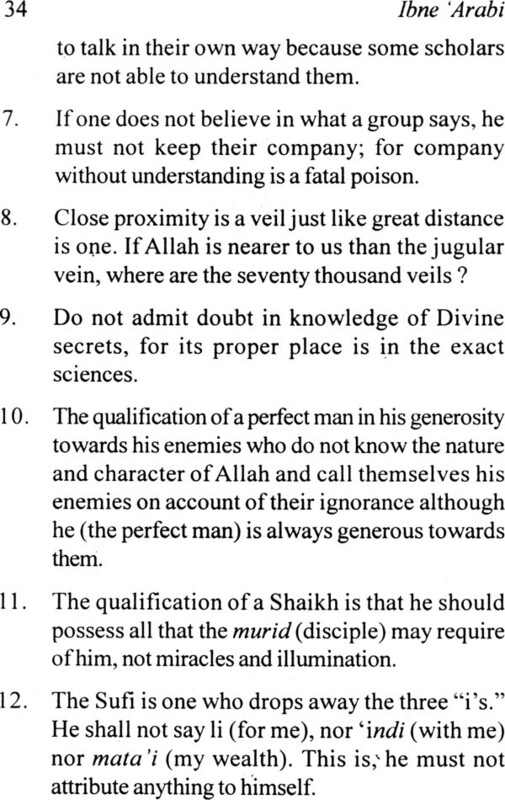 The materials are very abstruse and unyielding, and sweeping remarks and the Great Shaikh risky and bazardous. I am perfectly aware of my shortcomings and ill- providedness and send this book to the press with much diffidence and anxious prayers.